Infused with a free-spirited atmosphere, Madrid is home to high-energy nightlife, an incredible arts scene, and a culture like no other. Sample tapas and try your hand at flamenco dancing, or go to a famous soccer match. Visit El Rastro, the renowned flea market, or the reputed Prado Museum. Sample the wide range of dining—from traditional dishes to experimental Spanish haute cuisine. And after a day of exploring this varied city, dance the night away to the beats of techno and salsa, hip-hop and merengue. 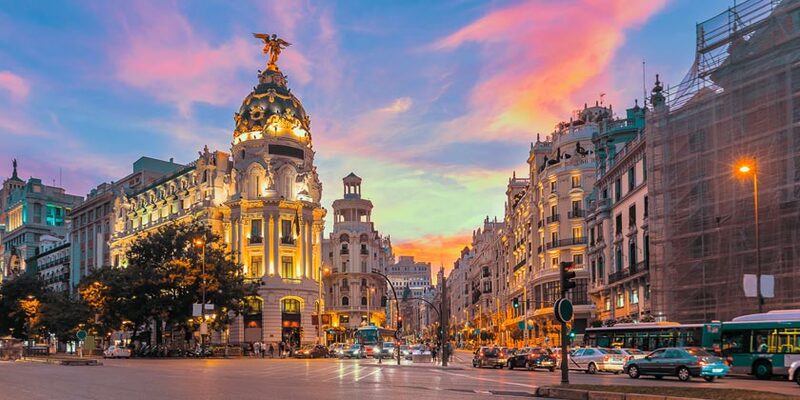 Where a long history meets an exuberance for life’s best experiences, travelers find the one-of-a-kind city of Madrid. Sample Spanish nightlife and Madrid's tasty tapas on an evening walking tour that will tantalize your taste buds! After exploring the tempting food stalls of Torrijos Market, head inside its cooking school to learn the secrets of Spain's much-loved gastronomy. Once the formal capital of Spain, Toledo is now considered as the country's spiritual capital with countless religious monuments and landmarks. Discover the rich history and culture of Madrid with your Madrid Card. Includes admission to over 50 museums and attractions! Marvel at the historic sights of Madrid on this city sightseeing tour. Get to know the history of the Spanish emperors by visiting the place from where they ruled the world for three centuries, and the place where they are buried. Resort info: A modern hotel in north Madrid. Highlights include an excellent location within walking distance of the Santiago Bernabeu football stadium. Resort info: A friendly hotel offering upmarket accommodation near the heart of Madrid. Highlights include fine dining, free Wi-Fi and an extensive wellness complex. Resort info: A modern hotel in the heart of Madrid. Highlights include an onsite cafe and an excellent location steps from the Museo Thyssen-Bornemisza. Resort info: A stylish, modern property offering luxury accommodation near the heart of Madrid. Highlights include fine dining, free Wi-Fi, a top-floor pool and gym. Resort info: A luxury property with an excellent location within steps of Plaza de Colon, the National Library and the National Archaeological Museum.